By Jen Wilkins, Volunteer on the Women’s Rights Programme at Amnesty UK, focussing on the women in Afghanistan campaign. From abuse behind closed doors to attacks on women participating in public life, violence against women continues to be committed at alarmingly high rates in Afghanistan – and largely with impunity. Although comprehensive statistics on violence against women in Afghanistan do not exist, the Afghan Independent Human Rights Commission (AIHRC) documented 3,331 instances of violence against women in six months last year, from 21st March to 21st September 2012. According to UN Women, 57% of girls are married before the age of 16. As an Afghan women’s rights activist recently told Amnesty, ‘violence is everywhere’ when you’re a woman or even a girl in Afghanistan. This is exacerbated by the consequences that face women who try to escape it. Women and girls who run away are often imprisoned for ‘moral crimes’ while their abusers go unpunished: in 2012, this amounted to about 400 women and girls. The fact that the overwhelming majority of police officers are male further deters women from reporting violence. Even if a woman seeks refuge in one of the 14 shelters in Afghanistan, a lack of funding and political support means they face severe overcrowding and rejection by their families. However, with troop withdrawal completed by the end of next year there is a very real possibility that these hard won gains could be reversed. Women’s rights activists in Afghanistan continue to voice their fear of being ‘sacrificed to the Taleban’ as international forces begin to leave. Now is the time for the Afghan government and its international partners, like the UK, to prioritise women and make sure this doesn’t happen. On Monday 4th March, during a major speech on aid and women’s rights, the Secretary of State for International Development Justine Greening said that dealing with violence against women in Afghanistan would be upgraded to a ‘strategic priority’. This is something that Amnesty UK has been continuously pressing for and could have a genuine impact on the ground in Afghanistan. We now need to see this commitment translated into a clear programme of work that includes funding for women’s shelters and helping the Afghan police force to support, not punish, victims of abuse. Greening was absolutely right to point out that women’s rights are not a side-line issue; they affect the whole fabric of society. Its systematic nature prevents women and girls from enjoying their full range of human rights and undermines long-term peace, security and growth. What’s more, if we want to keep improving the life expectancy of women and increasing the number of women and girls in politics and education, we must work to eradicate violence against women. 5)	Identify and implement specific and measurable improvements for gendered protection and support for Afghan women human rights defenders. If these crucial steps aren’t taken, violence will continue to prevent not only women, but the whole of Afghanistan, from making real and sustainable progress. As Greening said herself, ‘the future is never fixed – it can be different.’ We need to make sure DFID’s promises become a reality if this is to be the case. Act now and sign our petition to Justine Greening and Baroness Warsi here. 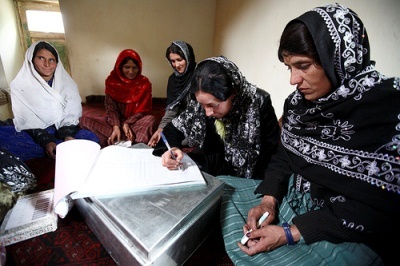 Photo of Afghan women’s self-help group by Canada In Afghanistan, shared under a Creative Commons licence. Five women are sitting on the floor in a circle holding pens, with a large book in front of them, which one of the women is writing in. I will sign the petition, great piece!